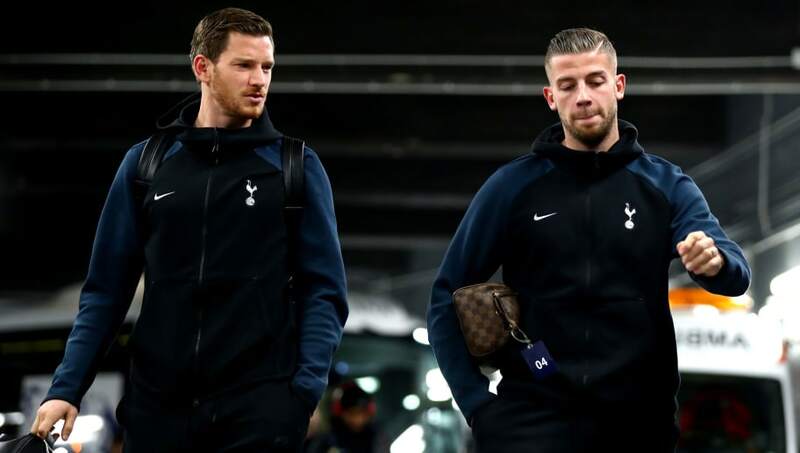 Tottenham defenders Toby Alderweireld and Jan Vertonghen have told their former club Ajax that they're not looking to return to Amsterdam this summer. The Dutch giants have been linked with making a serious investment at the end of the season as they prepare to wave goodbye to Frenkie de Jong and Matthijs de Ligt for a combined €150m, with the former's move already being confirmed by Barcelona. Despite being able to lure Klaas-Jan Huntelaar and Daley Blind back to the Amsterdam Arena in recent years, Ajax's sporting director Marc Overmars insists the two Tottenham defenders aren't thinking about returning for a few more years. "Of course those players always say that they want to come back to Amsterdam," Overmars told Ziggo Spor, via Fox Sports. "But then when I always call them you often hear that you have to wait a few years. "So I think with these two players we have to be patient and see what the future holds. It is still too early now." Alderweireld and Vertonghen spent nine years on the books at Ajax respectively, with both eventually featuring together 125 times in the Dutch capital before leaving for pastures new. Vertonghen, who joined the club first from Belgian side Beerschot in 2003, made 220 appearances across all competitions for Ajax, scoring 28 goals and claiming 11 assists. Alderweireld, meanwhile, another youth player from Beerschot, arrived at the Amsterdam Arena 12 months after his compatriot and went on to feature 186 times for the club before being sold to Atlético Madrid in 2013. The 30-year-old never really settled in Spain, however, and he was shipped out to Southampton the following season before Tottenham secured his signature in a £14m deal.